I wasn’t sure what to expect from The Sudden Appearance of Hope. Despite falling under the broad genre of “speculative fiction”, it’s different in many ways from my usual fare. 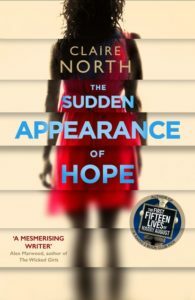 The protagonist of the book is Hope, a woman who cannot be remembered for more than 60 seconds unless you’re in an active conversation with her. She ends up using her “ability” to become a thief and a con-artist, but longs for normal human relationships. She’s doing pretty good with the strict rules she sets for herself, but she makes a mistake when a woman she enjoys spending time with commits suicide. She steals from people she would ordinarily have avoided, and that has serious consequences – she can’t just count on her abilities to hide her anymore, she has to figure out who she wants to be. I don’t think I did justice to the book with that summary, it’s also a story about the logical extreme of our culture of conformity and oversharing – the app Perfection which ingests every piece of data about your life and gives you rewards if you fit its definition of what a human should be. Hope is one of the players in this story, and it doesn’t matter that she’s forgettable, except to her own personal arc. I’m usually skeptical of media that features software or hacking as a major plot point; I’m a software engineer, and books and movies get it so wrong usually. I couldn’t really find fault with The Sudden Appearance of Hope, though – the description of connecting to the “darknet” via Tor, the details of how an app like Perfection would work, etc. It’s not perfect, but it was good enough that it didn’t draw me out of the story because it seemed implausible. I know that doesn’t sound like much, but it’s a huge compliment. Anyway, I really liked this book. Hope is unique, of course – she is always alone in the most awful of ways, and and pulls you into her worldview with surprising ease. The supporting characters are compelling almost because of the nature of the story, they have to be idealistic enough find ways to interact with Hope in a meaningful way. The book explores lots of interesting ideas about the nature of identity, the dangers (and benefits) of surveillance, and humanity’s inexorable attraction to conformity, while managing to tell both a tight personal story about Hope, and a broader one about the effect of technology on the world. This entry was posted in Books, Reviews and tagged fiction, science fiction, speculative fiction by Kriti Godey. Bookmark the permalink.